When your livelihood depends on you can depend on Furuno. After all, we've spent more than 30 years designing the finest electronics for commercial mariners using rivers, harbors and seas around the world. 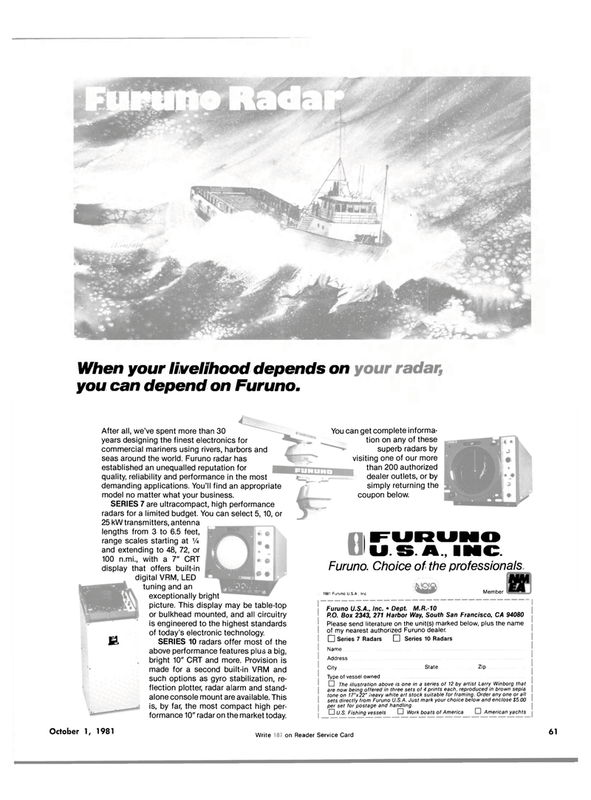 Furuno radar has established an unequalled reputation for quality, reliability and performance in the most demanding applications. You'll find an appropriate model no matter what your business. SERIES 7 are ultracompact, high performance radars for a limited budget. You can select 5,10, or 25 kW transmitters, antenna lengths from 3 to 6.5 feet, range scales starting at VA and extending to 48, 72, or 100 n.mi., with a 7" CRT display that offers built-in digital VRM, LED tuning and an exceptionally bright picture. This display may be table-top or bulkhead mounted, and all circuitry is engineered to the highest standards of today's electronic technology. You can get complete informa- tion on any of these superb radars by visiting one of our more than 200 authorized dealer outlets, or by simply returning the coupon below. 0FURUNO U. S.A, INC.